I came across some 2-1/4" aluminum pole/post stock. Cut 3 "rings" the same thickness as the bisquettes. They work great. Question. Did you have to polish them a bit to get them to slide over one another easily? My Bubba Pucks were a little rough at first (very little) but after a few cleanings with an SOS pad they're slicker than owl s... and slide very easy. These should be a lot lighter on long smokes and less grinding of pucks leaving those little chips that can jam the slider. "BBQs not the only pleasure in this world but it's way ahead of whatever's in second place." After cutting them, I removed the rough edges with a grinder. Must have been enough because I have had no problems after many smokes. Smoked some salmon today and, again, no problems with my freebie filler bisquettes. Do you use them as a reg bubbapuck or fill em with wood. I don't think I'd put wood inside. If you're using three pucks, one will slide onto the burner plate with some potentially dangerous results. Probably won't Con but it did get me thinking. I use all three for filler at the end so they completely push all the spent bisquettes into the bowl. I normally shut the smoke generator off after the smoking time is up so the first "ring" never really sits on a hot generator very long. Never left it on for an extended period. 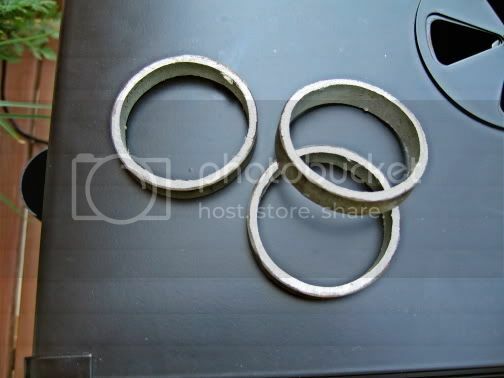 I just obtained 24 aluminum rings that are 2.25" in diameter and 1/2 inch thick. I use these a refillable pucks. I place heavy tin foil in the bottom and press in fine wood chips to form a flat bottom. I the roll the excess foil over the top to make a uniform puck. I them perforate the top with a fork to create a substantial amount of hole for smoke to escape. I load as many pucks as I need after preheating the burner for 20 minutes. Works great. Cost of refilling each puck is quite negligible. Interesting approach, tresnik. Considerably more straight forward than some other DIY bisquette ideas I’ve seen.